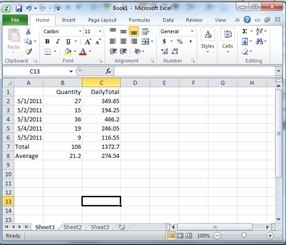 Many of our clients are pros at Microsoft Excel, but for the beginners, the program can be intimidating. If you're just getting started, here are a few simple tips and formulas you can use. We actually get a lot of questions from beginners, so this post is for you! 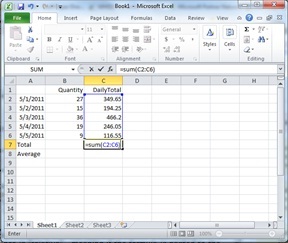 Formulas are the workhorse of Excel. 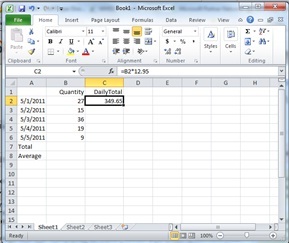 When you enter a formula into a cell, Excel will calculate the value for you. In a simple example, suppose you sold cables for $12.95 a piece for a week and you wanted to know the daily totals, the weekly total, and the daily average. Of course you can use a calculator to get the answer, but Excel is a LOT faster, and worth the effort of learning. Also, after you program in the formulas, you can change your input values and quickly see the new result. Next, to calculate the sum of a column, use the formula: =SUM(C2:C6). Note that after you create the open parentheses, you can simply drag your mouse over the cells. Finally, to calculate the average of a column, use the formula: =AVERAGE(C2:C6). The final worksheet shows the daily totals, the total quantity, the total sales, and the daily average. Sometimes the hardest part of using a new application is just getting over the hump of getting started.